and you have a clash between those artists with original spirit and personality and those who sort of fall out of the memory. It is hard, in a modern age, to grab attention and hold people spellbound and hooked – we often wander between artists and struggle to keep focused for too long. I tend to find those who hover on the fringes of the mainstream hold the most power and grace. 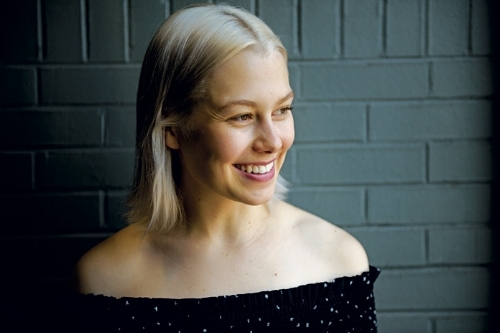 Phoebe Bridgers is one of very few modern songwriters who tick all boxes and stay in the mind. I am not suggesting we lack great songwriters in the world but too often, to me, the modern artist lacks all the necessary qualities for longevity and stardom. There is something grounded and yet inaccessible about Bridgers. To me, she seems to be the ultra-cool and popular: someone people would flock around; she would attend the best parties and people would hang on her words. That said, there is no ego and arrogance from the American artist. At twenty-three-years-old, the L.A. musician is getting her music to the world and taking some big steps. She has been playing music for a while but her debut album, Stranger in the Alps, arrived last year. I find a lot of young artists, when they release debut albums, tend to sound either too nervous or similar to someone else. “The album’s also full of interesting cadences, both in terms of the rhythms employed and Bridgers’ verses. Her words sometimes spill out over the meter and convey the messiness of a thought in a way that matches the rough-hewn sentiment of a song. These arrangements complement her voice beautifully. Multiple tracks feature intricate guitar-picking sequences, while Bridgers sings out with a voice that reverberates in the spaces between the notes”. The narratives that run through the songs draw the listener into the song and involve you in the imagery. One track might see you in a car with Bridgers as she observes the American landscape with thoughts of relaxation in her mind; another might look at a mortality and personal relevance. It is the beauty and inventiveness of the debut album that strikes me. Another artist that strikes my thoughts, when thinking of Bridgers, is Billie Marten. She released her debut, Writing of Blues and Yellows, in 2016 and that record moved me immensely. I adore the beauty of the vocals and how (Marten) mixes Folk of the past with something modern to create her own world. It is the intimacy and sense of revelation that got into my soul. Marten does not push the listener away and hide: the British teenager wants people to come into her life and walk with her. The same can be said of Phoebe Bridgers. She, like Marten, seems like an older head on younger shoulders. There is elegance and wistfulness on some songs; in other moments, one gets the sense of a curious woman trying to get more from life and get out of a funk. I can imagine Bridgers’ early life and childhood was about exploring older artists and legends like David Bowie and Joni Mitchell; vintage representations of Los Angeles and dusty books. Maybe I am painting her as a heroine of a classic novel but, unlike many of her peers, it is the music and work that matters most. You get the sense so many artists are all about Instagram and followers; how to market themselves and lose any sense of personality, naturalness and physicality. Bridgers engages in social media but, looking at her Twitter feed, and she is much more personable, appealing and open. She might offer a random thought or ask questions of her followers – there is a loose and accessible aspect you do not get with a lot of songwriters. In many ways, it will be fascinating to see how Bridgers follows her debut and what direction she takes. Worldwide attention and increased popularity could go to an artist’s head and change their music for the worse. That is a gamble for most but I feel, with Bridgers, she will produce something similar to Stranger in the Alps. There are so few artists able to produce such intelligent and scenic/story-like lyrics together with music that has grandeur, complexity and so many colours. It is amazing to think (Stranger in the Alps) comes from someone so young, making her first steps in the industry. Maybe there is a pressure to follow up something so great or an accompanying pressure regarding emerging talent and how Bridgers will keep her place. These anxieties are natural but she need not fear anything. Her debut is still gaining a lot of love and recently, she worked with Noah and Abby Gundersen on Killer + the Sound. It is a wonderful, haunting single that takes Bridgers’ voice in a new direction. Listen to the songwriter speak in interviews and she comes across as a typical, if more intelligent and cultured, American woman who wants to touch people with her music. There is confident and humour but she has a shyness and reservation that suggests, when she comes away from the stage or winds down, she shuts the world away and focuses on herself. It is hard to say either way: Bridgers has a slight enigma and mystery that add to the musical experience. “Doing stuff on my own terms and making a record without being signed to a label – I credit that all to my commercial work,” she says. “I was playing so many shows at the time that I barely even went to my senior year of high school and was certainly not turning a profit. Then I did that commercial, which was only five days’ work, and it was like getting signed to a label. It was like a development deal”. We have an artist who wants to make music on her own terms and, aside from a high-profile advert, is not willing to get into bed with labels and advertisers. The authenticity and sense of self is important to her; not bending to commercial demands and making an album that sounds right to a label. In the same interview, she talked about Ryan Adams – they brief dated not long after he turned forty (she was twenty) – and a song that was inspired by him. “Growing up in LA, with parents who never had much money – her father was a construction worker; her mother, a receptionist – Bridgers cloistered herself in a twee Harry Potter world. Her bedroom, she says, was a shrine to the J K Rowling stories. “I was totally obsessed until I was about 13 – I love that the female characters aren’t just accessories.” She gets out her phone to show me a picture of her posing gleefully at Platform 9¾ at King’s Cross station”.